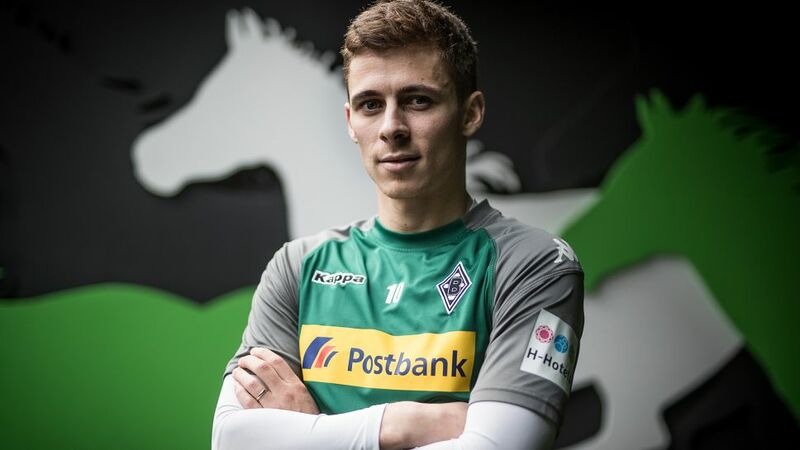 Bundesliga | Borussia Mönchengladbach's Thorgan Hazard: "I feel great in this team"
Borussia Mönchengladbach's Thorgan Hazard: "I feel great in this team"
As the Bundesliga returns for the second half of the 2017/18 season, one of the league's best players, Thorgan Hazard, in one of the league's best teams, Borussia Mönchengladbach, has a lot to be happy about. But the Belgian brother of Chelsea's Eden is far from satisfied. Before the Foals travel to Cologne in the season's second installment of the always lively Rhein-Derby, bundesliga.com sits down with Hazard to discuss the season so far, why Dieter Hecking has labelled him the "penalty king" and his thoughts on what could be his first World Cup, in Russia this summer. bundesliga.com: Mr Hazard, how did you spend the winter break, and how are you feeling head into the Derby against Colonge to start 2018 on Sunday? Thorgan Hazard: I switched off nicely and spent a lot of time with my family. We were together in Disneyland in Paris and then in London with my brothers Eden and Kylian. And then the time was right to restart work and get myself ready for the game against Cologne. I really like that we start with a derby. You are then automatically in competition mode. But it will not be an easy task for us. bundesliga.com: You meet a team that sits bottom of the table with just six points. How big is the danger of underestimating them? Hazard: Just six points – with that you could think that you are coming up against a bad team. But first of all, we know better, and secondly, the league table means nothing in a derby. Even the first game (at the start of the season) was tough, even though we won 1-0 in the end. Obviously Cologne want to win this game. But we obviously want to win our second Rhein-Derby of the season. And what matters to Cologne, also matters to us: A win in such a big game can have a big effect on the upcoming challenges for us! bundesliga.com: You’ve played in 17 of 17 possible games for you, and in them, have scored six goals and have six assists. Where do you see the reasons behind the fact that you’ve played your best half of a season for Gladbach? Hazard: I think that in the time of about two years, since I’ve played alongside Raffael in attack, it’s worked really well. I can’t say in detail exactly why it has worked so well this season. Watch: Thorgan Hazard's top 5 goals at Gladbach! bundesliga.com: How much has your current head coach, Dieter Hecking, made a difference to your performances? Hazard: In any case, I always feel great confidence and belief from Dieter Hecking in my abilities. I feel great in this team and also in our style of play. This system almost always gives me the chance to score goals and assist. And that, all without my playing once in my favourite position, in the middle. As far as my six goals are concerned, that has to be put into perspective. Firstly, I scored four of them from the penalty spot. If I had taken all my chances in games, I could probably have ten or more goals. That’s why it’s very important for me to keep working hard on my efficiency. bundesliga.com: In fact, you missed a few big chances, for example against Borussia Dortmund and Bayer Leverkusen. How do you then manage not to fall into a scoring-rut and keep your confidence up? Hazard: There’s no psychological trick or methods I would use in those moments where I miss a chance. Rather, I see it as a quality not to allow it all to go to your head. I know that I can create even more chances after a negative moment. Experiences show me that I usually get at least two very good chances per game. So, if I miss the first one, I can hope to do better on the second one. Watch: Hazard scored from the spot as Gladbach beat Bayern in November! Hazard: You’re talking about the penalty against Hannover which took a few minutes because of the Video-Assist. Sometimes I do think about where to shoot, but sometimes I only decide as I run up and see where and if the goalkeeper moves. Like it was against Hannover. “Tobi” Sippel (Gladbach’s second-choice goalkeeper) told me that Hannover’s goalkeeper would move early. So I waited to see what way he went and responded accordingly. Hazard: I can understand how some people got that impression. But there are only four points between second and eighth place, and with Dortmund, Leverkusen, Leipzig and ourselves, who all have 28 points. This shows how extremely balanced the Bundesliga is and that every game is a huge challenge. It’s also important to remember that we suffered a lot of injuries and that we do still have a young squad. It’s perfectly normal that not every player can produce consistently good performances over 17 games. However, you’ve seen, for example, that with the win against Bayern, this team can do great things. bundesliga.com: The Belgian football fans expect great performances at the World Cup in the summer from the "Red Devils". How are your chances of running alongside your brother Eden in the Belgian jersey in Russia? Hazard: I think my chances are definitely bigger than at the 2014 World Cup or the European Championship 2016. In 2014 I was still playing in Belgium, in 2016 I was not a regular at Gladbach, so unfortunately I wasn’t there on both occasions. Since Roberto Martinez was Belgium coach, I have been called up a lot. And I think that I also showed that I can help the team. I have great hope that I may be present at the World Cup. However, I’m also aware that in the coming months my performance at Gladbach will have to be right first. bundesliga.com: What would it mean for you to play alongside Eden with Belgium at a World Cup? Hazard: It’s always been my greatest wish to run around with Eden for the national team. This wish has now come true in qualifying for the World Cup. That's why I no longer speak of a World Cup dream today, but of a World Cup goal that I pursue. bundesliga.com: Also your second brother, Kylian, has been playing for Chelsea since last summer, albeit only in the U23. Will Kylian soon be the third Hazard in the jersey of the "Red Devils"? Hazard: Kylian is a great footballer and the move to England, and to Chelsea, was absolutely right. But he is only 22 and has yet to prove himself in a professional team. He knows that Belgium has a very good national team with many very good players. If you want to play there, you have to be successful at a well-known club. bundesliga.com: Belgium is - compared to Germany, France or Italy - a smaller country with a correspondingly smaller population. Nevertheless, Belgium always produces many outstanding footballers. What explanation is there for that? Hazard: It’s actually extraordinary to have so much footballing talent for such a small country - even though there have been periods in which Belgian football hasn’t been as successful as it was in the 70s and 80s, and again for some years. I think that in Belgium, there has been a significant improvement in the work of youth coaches so that the level of the Belgian league has clearly increased again. The many Belgian players at European clubs are proof that the Belgian clubs are doing a good job. bundesliga.com: Also in Germany, 2000 was a crisis for the national team and a trigger for a revolution of young coaching. Did the Jupiler Pro League (Belgian top flight) follow the Bundesliga? Hazard: It’s true that many Belgian clubs have also created junior performance centres in recent years. Nevertheless, in terms of youth work in Belgium, I would speak less of a German than of a Dutch model. As in the Netherlands, our focus in the early years is mainly on the training of the technical basics. But the fact that the Belgian clubs look very closely at the Bundesliga and the perfect organisation of German clubs is also true. bundesliga.com: Belgium was considered a secret favourite at the 2014 World Cup in Brazil. How has the team evolved since then? Hazard: Over the past three and a half years, the team has gained tremendous experience by participating in the 2014 World Cup and 2016 European Championship. Nearly every player today is under contract with a top club in one of Europe's top leagues and is challenged week after week. Therefore, it’s not surprising that some experts see us as co-favourites for the World Cup title. But there are other, bigger favourites than us. Favourites that wear significantly more stars on the chest than we do. (laughs) These teams have long known how to win such a tournament. Factors such as possible injuries of players after a long season as well as the necessary little bit of luck, that it also needed if you want to become World Champion. In any case, we want to go as far as in the last two tournaments. There Belgium has only retired in the quarterfinals. bundesliga.com: What do you think of the German team? Watch: We met Hazard back in 2014 to find out more about his roots! bundesliga.com: Do you think that Brazil processed the German trauma of 2014? Hazard: Brazil is definitely one of my favourites too. The Selecao has many players at a world-class level, almost everyone is an outstanding individual. And now these individuals have grown back together into a real, functioning unit. A game like the 7-1 in the semi-finals in 2014, Germany almost definitely won’t be able to do that again against Brazil. Borussia Mönchengladbach travel to Cologne on Sunday for a Rhein-Derby to start 2018. Click here to read more Borussia Mönchengladbach news and features!